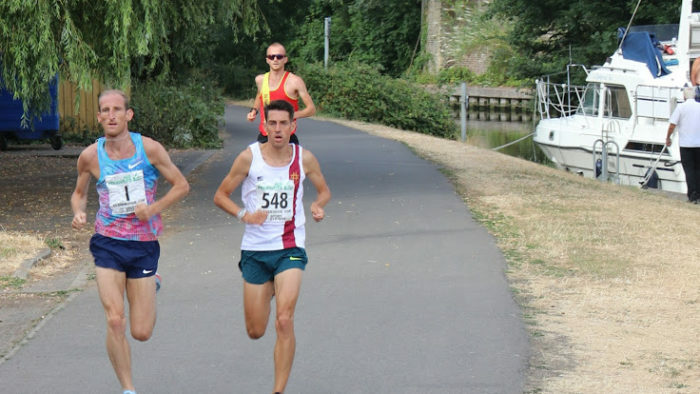 With a 10km personal best of 28.49 minutes, Scott Overall of Blackheath and Bromley AC was always going to be the man to beat in the 35th Elmbridge 10km race. On a warm morning at the new riverside athletics stadium, the 2012 Olympics marathon man set off down the towpath at a scorching pace. With Kevin Quinn of South London Harriers for company, the pair ran the first 3km in just nine minutes. The eventual winner reflected that “It was a bit fast, but we had the wind behind us, so on the way back we had the wind in our face.” Despite Quinn’s strong challenge, Overall pulled out a lead over the final section to win in 30.53 minutes, with Quinn second in 31.19 and Ollie Garrod of Epsom & Ewell third in 31.58. In the ladies race Eleanor Harrison was in charge throughout. The Collingwood AC duo of Lisa Rooney and Debbie Jackson went with her at the start, but by the 3km mark the Guildford and Godalming athlete was 300m ahead. That gap increased to see Harrison win in 37.27 minutes, with Rooney second in 39.13 and Jackson third in 39.40. Guildford & Godalming AC won both the Men’s Ladies team events. The best age-graded performances were by Andrew Leach of North Herts in 33.49 minutes to win the men’s 50 to 59 age-group and Bob Bradbury of Woking AC who ran 38.05 to win the over men’s 60 to 69 age-group prize. Lynn Willacy, of race sponsors Air Products, presented the prizes. A donation from race proceeds is made each year to Cross Roads Care Surrey. Alastair Patterson representing the charity, spoke of their work supporting carers who look after a relative or friend with a significant health condition or disability. They give carers regular breaks from their responsibilities. Their work in Walton includes a ‘Saturday Club’ which provides children with a regular day of enjoyable activities, thus giving their carers some valuable respite. To see all results go to the Sportsystems website. New runners are welcome at Elmbridge Road Runners. For details see website.